For many schools up north, this will be the last major invitational of the season as teams prepare for their respective league finals. The meet will take place at Hughes Stadium starting at 11am with the invitational portion starting at 3pm (field events) and 5:00pm (running events). Most of the schools attending are from the San Joaquin Section although there will be teams attending from other sections as well. Couple of other meets of notes the next two days. The Warren/Eaton Relays will take place at Acalanes HS. Looks like a great field in the boys' 3200m. race with lots of runners that have broken 10 minutes this season. On Saturday, Castlemont will host the Bay Area Frosh/soph Championship. North Salinas will host their own F/S highlighted meet also on Saturday. Lists based on marks reported to The Chronicle, dyestatcal.com, Bay Area newspapers and internet sources. c - converted from mile. Wind-legal marks only. No dual-meet results, relay splits or marks against non-high school competition are included. For corrections and updates, e-mail ddayton@sfchronicle.com or call (415) 777-7941. Leaders include athletes who attend schools within San Francisco, San Mateo, Alameda, Contra Costa, Marin and parts of Santa Clara, Solano and Sonoma counties, along with members of the West Catholic, Marin County and Santa Clara Valley athletic leagues. Are there any athletes, times or marks that are missing and should be included? Today we chat with Carmel 400/800 runner, Hank Morrison. 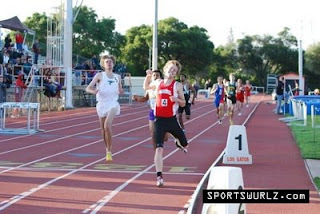 At last Friday's CCS Top 8 Meet, Morrison was a double victor as he swept the 400 and 800 in 49.80 and 1:59.09 respectively (He is pictured to the left winning the 800 over Palo Alto's Philip MacQuitty). Considering the weather at the meet (cold and windy) and the relative closeness of the two races, it was an impressive double victory. He will be one of the favorites come CCS time to qualify for the state meet following his narrow miss last year as he finished in 5th place recording a 1:56.25. 1) How did you get started in Track and Field? I started running track in 6th grade when I lived in Charlotte, North Carolina. 2) When did you first realize that you might have the talent to succeed in Track and Field? I think I realized I could have some potential when I moved to Carmel in 8th grade. Then I met Coach Ables and he saw potential and I've been running ever since. 3) As you were first starting out in the sport, who were the runners that inspired you (from your own team or other teams)? Of course runners like Steve Prefontaine have always been an inspiration, but I've always idolized runners like Alberto Juantorena and Sebastian Coe. 4) Tell us a little about your coach and how he has helped you develop as a runner. Coach Ables is a pretty interesting guy. He's 72 years old, and a Monterey Peninsula native. He started off as a football coach, but when there was a falling out between he and the head coach, he decided to switch over to track. He's very old school, preferring not to be involved with parents, and he's often at odds with the school administration, but he loves the kids and the kids love him. I met him when I came out for cross country freshman year. He saw potential in me, and never let me off easy. I think the high expectations he has had for me, in combination with the great training he and the other coaches provide have been a major help in my success as a runner. 5) You finished in 5th place last year at the CCS running 1:56.25. How did the narrow miss to making the state meet, motivated you for this year? Well, I really wanted to make it to state last year, but it didn't happen, so now this year is my last chance. I really want to make the most of the season, so I'm pretty motivated. 6) Some quick answers: your favorite event? favorite meet? favorite competitor(s)? Favorite event: 800. favorite meet: I loved arcadia, but avis kelley and quicksilver are always good. Favorite competitors: I love running against the guys from Monterey (Jake Arveson, Joel Kemper). In Jake and my case we've sort of grown up as runners together, we ran track in middle school together and we've been able to run against each other all 4 years of high school. They're very talented, and they're nice guys too. 7) What workouts do you do that you feel help you the most in terms of your 800m. racing? What does a typical week look like for you? I wouldn't say I enjoy them the most, but 600m intervals in combination with 300s and 200s are really good for me. Usually, Mondays and Tuesdays are pretty difficult, with Wednesdays being pre-meets, Thursdays league meets, and Fridays are pretty relaxed for invitationals on Saturdays. 8) What would you say has been your best race so far this season? I'd have to say my 800 at top 8 has been my best race. It wasn't the fastest I've had this year, but I was really relaxed and had a strong kick, which was surprising because I ran a 400 40 minutes earlier haha. 9) Who do you feel will be the competitors in CCS for the three state meet spots in the 800m. this year? That's a pretty tough question. The 800 is pretty stacked this year. Kevin Jani, Nathan Strum, Jake Arveson, me, and I've heard Philip MacQuitty ran a pretty fast time last week. 10) Have you decided where you are going to college next year and how much did running contribute to the decision you made? I'm going to the University of Oregon next year. I'll be running track. It was a pretty big part of my choice because of Oregon Track's history and potential for the future. 11) What would be your best advice for young runners who want to succeed in Track and Field? Have fun with it. Don't take it too seriously. It stops being fun when you can't remember why you're doing it. Thank you very much Hank! AJC! Nice article in today's San Mateo Daily Journal covering two conference champion athletes from the College of San Mateo Track and Field team, Brandon Becerra (distance runner) and Kelly Young (thrower). You can now follow Cross Country Express on Twitter at www.twitter.com/ccexpress. For those of you that are not on twitter, it's free and easy to sign up. Go to their home page to get started. I will update everybody with some of the exceptional marks that are taking place at local track and field meets. With other coaches joining, we will all be capable of keeping each other in the loop in real time. Wanted to move this entry back to the top. I think twitter would be a great way to get instant results from meets. You can see my address at the top so that you can follow my updates. Anybody can do the same by signing up for twitter and entering great marks from meets you are attending. If you are not interested in what offensive lineman the 49ers are picking today then the Penn Relays are what you are looking for at 1pm. It will be on ESPN2. 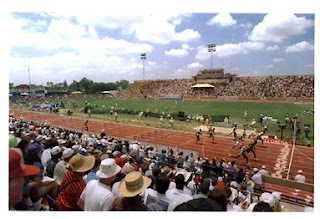 One of the legendary American Track and Field meets that will not disappoint. On a side note, there was a Mike Singletary sighting at the CCS Top 8 meet yesterday as his daughter runs for Valley Christian San Jose. Not sure if Roger Craig was there as his son (Woodside's Alex Craig) finished in 2nd place in the 400m. behind Hank Morrison of Carmel. Article about Shannon Rowbury (pictured to the left here) in today's SF Chronicle. She will be racing the 5000m. tonight at Berkeley to work on her "strength" once she returns to her best distance, the metric mile (1500m.). Hopefully Flotrack.com will be there covering the races so we can catch it online for those of us that won't be able to attend. Most of the top Track and Field athletes will be present tonight competing at Los Gatos HS in the annual CCS Top 8 meet. Should be an exciting evening of track racing and field events that will conclude under the lights. If you are planning on being at the meet, be sure to bundle up as we are certainly not experiencing a heat wave anymore. As some of you may know, Phil Wilder of Moreau Catholic is stepping down as the school's cross country coach. He will continue to teach at the school but this past cross country season (his 28th season) was his last. Check out the following article to learn a little more about this outstanding person and coach. Peter Brewer beat me to the punch with his comment below but I would love to hear from fellow coaches or past Wilder athletes about their interaction with him. My contact with him has always been very positive and I have always been impressed with the size and sportsmanship of all his teams. Lots and lots of newspaper articles covering most of the invitationals that took place this past weekend. If you know of any others, send me the link to albertjcaruana@gmail.com and I will add to the list. Olympian Jorge Torres will be racing. What looks like the most competitive races this Friday? What is the toughest event to qualify to the state meet? What events will have at-large marks met from CCS this year? This summer, I will be hosting a new high school distance running camp in beautiful Marin County. There are a host of great running camps out there already and we hope to add to that list, providing another option in Marin (just north of San Francisco). Applications are open and students should reserve their spots soon as we are starting to fill up! The camp will be July 26 to July 30, 2009 @ Dominican University. The Marin Distance Running camp will be a memorable week of distance running along the majestic hills and dales of Mt. Tamalpais, the expansive Marin Headlands, the Pacific Ocean, and the historic Golden Gate Bridge. High School Distance Runners will immerse themselves in a world of distance running for 5 days with an opportunity for team building and camaraderie. Participants will learn from topnotch coaches, clinicians, athletes, and experts on a variety of running topics. We have a host of All-American collegiate runners on hand to help and proffer advice and insight, a nutritionist, a speaker on goals and leadership, a DII 800 meter national champion who is an expert in high school weight lifting and core work, and much much more. We really have a stellar line up for the athletes with a focus on getting them to the next level and learning while having fun. For local athletes, we have a commuter rate too. Please pass along to runners who might be interested in attending in your program. ** A Running Experience of a Lifetime." The above article is actually not correct because his time converts to above 9 minutes for a 2 mile race. Nonetheless, a spectacular solo effort! The most prominent teams that have switched divisions are De La Salle HS which moves up to Division I, College Park HS which drops down to Division II, and Livermore and Washington HS which move up to Division I. Not sure if those changes affect the divisions other than College Park is now in Division II minus three of the better teams, DLS, Livermore and Washington. If I missed any other teams that have moved divisions, please mension them in the comment box below. Pre-season rankings will come out in June. If you have any information that may be helpful in ranking the teams going into the '09 season, please send it to albertjcaruana@gmail.com. Anybody want to throw out there the top 3 teams in each division for next year (boys and girls)? Who are going to be the surprise teams? What teams have improved the most since last cross country season and are really tearing it up on the track? What teams lost the most talent with graduating runners? Who are the hot shot 8th graders coming up? The following list is courtesy of Keith Conning and his blog (THE CONNING TOWER) which you can find at http://theconning tower.blogspot.com. The marks are updated through the Arcadia Invitational. Hammed Sulemad 12 Deer Valley Triple Jump 50'3"
Rob Simmons 12 Rocklin Pole Vault 16'1"
Alitta Boyd 12 Moreau Catholic Triple Jump 41'7.5"
Kiersten Dolbec 12 Saratoga High Jump 5'8"
Lindsay Machado 12 El Dorado Discus 135'2"
Jackie Alhoo 12 St. Mary's (Stockton) Shot Put 44'10"
Any other marks that belong with the group above? 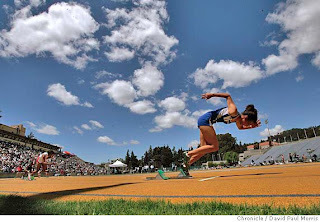 Are the two triple jump marks the best marks for Northern California athletes? Registration is now OPEN for the 1st Annual Downtown San Rafael One Mile Race. This will be a fun and fast race for people of all ages and abilities to see just how fast they can truly run ONE mile. The race traverses a loop right through the heart of downtown San Rafael, along 4th and 5th Streets. --7:45 am: Ages 19 to 39. --8:15 am: Ages 40 and over. --8:45 am: Ages 18 and Under (we encourage kids to run!). We partner with the Tamalpa Runners www.tamalparunners.org to put this race on. Add any newspaper article links I may have missed in the comment box below. In regards to the Arcadia Invitational, what were some of the most impressive performances by Northern California athletes? 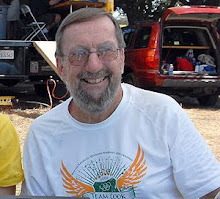 Congratulations to Jason Fung of Palo Alto HS and Mary Tuff of Mills HS for being named 2009 CCS Track and Field Honor Coaches. Jason Fung (pictured to the left courtesy of the paly voice) of Palo Alto High School has been the school’s Track & Field Coach since 2000. A graduate of Palo Alto HS, Jason returned to Palo Alto as an assistant coach in both football and track after finishing his undergraduate studies. In addition to his coaching duties, he was an aide in an alternative Learning Program for “at risk” students under Paul Jones, retired track coach, Palo Alto HS. Earl Hansen, Palo Alto Athletic Director, says of Jason: “…The athletes respect and perform for Coach Fung…This is a tribute to his hard work and professional style. He is organized, knowledgeable and an intense competitor, students really respond to this style of coach. ……a man that is committed to being the best coach he can be and at the same time keeping everything in proper perspective. He works with all levels of the athletes that he has, not just the so-called elite athletes, he builds true track teams not just individuals.” Paul Jones, Palo Alto retired track coach, supports wholeheartedly the nomination of Jason Fung . Mary Tuff has been the Track & Field coach for Mills High School for four years. Prior to coming to Mills HS, she had coached Half Moon Bay for 4 years and San Mateo for 7 years. Mary also coaches the Mills HS Cross Country team. Mary has been a member of the New Balance Excelsior Track Club for 10 years and the USA T&F for Level 1 & III Sprints Coaches for 11 years. Photo above is courtesy of Mark Foyer and the Half Moon Bay Review. Today we chat with the fastest returning 400m. runner from the CCS meet last year, Half Moon Bay junior, Lauren Irish. As a sophomore, Lauren won the Peninsula Athletic League (PAL) title in the 400m. with a time of 59.38. A week later at the CCS trials, she improved her time to 58.09. Her breakthrough race came at the CCS finals in Gilroy HS where she finished in 2nd. place behind senior Kristen Houp of Valley Christian in a lifetime best of 56.36. She has been running well this year participating on mostly relay teams as she prepares for her debut this year at the Arcadia Invitational. 1) How did you get your start in Track and Field and Cross Country? I always played sports when I was younger and usually my favorite part of the other sports was the running/sprinting, so I thought I'd try track. 2) When did you first realize that you had the talent to succeed in Track and Field? In middle school I did pretty well, then in 9th grade when I started getting pretty good times I started to get really into it and get motivated. 3) Was the state meet on the radar last year before the season? Not at all. I was hoping to make it to CCS, but I didn't expect to improve my time so much in one season. 4) What would you say was your best race of the season last year? What about this current season? CCS Finals. I think my best race this year is still yet to come. If any, an 800 in our dmr at Chabot. 5) What are your current PRs for 100, 200, 400, 800? 100-12.99 200-25.5 400-56.36 800-2:19(in a relay). 6) What did you do differently training wise in preparation for this season? I biked a lot during the fall/winter. Other than that I wasn't really able to train because i was still recovering from knee surgery I had last June. 7) Favorite race? Favorite meet? Favorite competitor? Favorite workout? I love relays, especially the dmr. Running it at Twilight in San Rafael is always a blast. But the 400 is my favorite individual race. I like doing 200's for workouts. I can work on my speed for 400 while also getting a tough workout breathing wise. 8) During your time on the high school track and team what athletes would you say were your inspiration or athletes you looked up to (could be from your own team or other teams)? Last year racing against a senior Kristen Houp was intimidating but it made me set goals for my junior/senior years. If i can run the same times she did as a junior and senior, i would be very happy. From our team, Frank Lima, because he has a very good work ethic and you can always tell how much he enjoys the sport. Plus he jumps 6" 6' in the high jump, which is crazy. 9) Tell us a little about your coach and what he has meant to your development as a runner. My coaches have always helped me to stay focused and work as hard as I can. Pretty much, I wouldn't accomplish anything without them. 10) What was your first state meet experience like last year? How do you think it will help you for this current season? Most intimidating experience of my life. I was very nervous last year, so if I make it again I will hopefully be able to keep my mind on the race and not get caught up in the moment. 11) What races are you really looking forward to the rest of the season? Arcadia, this Saturday. I know there will be really good competition and I am hoping to get a pr and try and stay close to the front finishers. Its a great sport and in pretty much all cases the other athletes I meet make it even better. I am also so thankful for all the support i get from my family and friends. Do you have plans for Friday and/or Saturday evenings this week? If not, and assuming you’re not too far from Chico, CA, you might want to consider checking out the Chico State Twilight Distance carnival track and field meet to be held at University Stadium. In 2008 the Men’s mile was the highlight event of the Chico Twilight Distance Carnival with Chico’s Scott Bauhs taking the victory in a school record 3:59. Bauhs would later become the fourth fastest American Collegiate ever, at the 10k distance during his final year as a Wildcat. In 2009 the metric version of the mile takes center stage and again Bauhs will be a big part of the excitement. As news of Bauhs’ ’08 mile run made it’s way through the distance running circles, top athletes took notice and partly due to this we have attracted the best field of middle distance runners to ever assemble on a track between Sacramento, CA and Eugene, Oregon. Highlighting this list is Steve Sherer of the New York Athletic Club who has run 3:55 for the mile distance and 3:36 for the 1500m. Sherer is one of the top mid distance runners in the U.S. and will provide plenty of competition to Bauhs and the rest of the talented field. Also topping the list of talented entrants is University of Colorado Alum Brent Vaughn. In 2008 Vaughn ran the fastest 5k in the NCAA and recorded the second best mark by an American for the year. A short bio on the top entrants in this field will be provided below. 3:55 Mile PR. Sherer was the 7th fastest 1500m runner in the U.S. in 2008 and the second fastest Indoor Miler in the U.S. In ‘08! Brent Vaughn-NIKE (University of Colorado Alum) 3:43-1500m PR. While a senior at Colorado last Spring Vaughn recorded the second fastest 5k by an American in 2008 (13:18) and the fastest by a collegiate athlete. The only American to run a faster mark for the 5k distance in 2008 was 2008 World Champion Bernard Lagat. Michael Wickman-Chico State University 3:46.11 1500m PR. Wickman is a 2 time All American for the ‘Cats (once in track and once in XC) and leads all DII runners this season in the 800m where his 1:49.90 personal best is the #5 mark all time at CSUC. Wickman a Junior from Walnut Creek, CA recorded his 3:46 PR for the 1500m while red shirting during the 2008 track season. Charlie Serrano-Foot Pursuit Running 3:52 1500m PR. Serrano a Chico Alum was the 2007 NCAA 5,000m champion (14:07) finishing with teammate Scott Bauhs who placed second. Serrano has recorded some very fine marks since college, including a recent 17th place finish at the US 15k championships in Jacksonville, Florida where he split 29:31 for the initial 10k of the race. Serrano is fit and ready to run fast! Angel Marquez-Chico State University 3:50.17 1500m PR. Angel surprised the field by finishing as the NCAA runner up in the 1500m at the 2008 Championships. His recent 14:14 PR for the 5,000m ranks #3 All Time for the ‘Cats behind NCAA champions Scott Bauhs and Charlie Serrano. Cameron Kreuz-Southern Oregon University 3:51 1500m PR. Cameron is currently enjoying a breakout season. He recorded his 3:51 PR on a windy cold day in Sacramento while winning the Hornet Invitational 4 weeks ago. Kreuz is currently ranked #5 in the NAIA with this mark. He has also run 1:52 for 800m this season. Sean Williams-Brooks-Eastside TC 3:50 1500m PR. A native of Idaho Sean recently placed 6th overall (3:51) at the Oregon Preview meet in Eugene, OR. David Wellman-Chico State 3:55 1500m PR Wellman has just moved up to the 1500m seriously this season. His 800m PR (1:51) shows a lot of promise toward the longer distance. He is currently ranked 6th in Division II for the 800m event. Beau Rogers-Chico State 3:55 1500m PR Rogers has an Auto qualifying mark (9:05) for the 3,000m steeple event for the upcoming NCAA championships. He is current ranked #3 in DII for the steeple and will attempt his second 1500m of the season at the twilight meet. Eric Malain-Humboldt State 3:55 1500m PR run last weekend while winning the Johnny Mathis Invitational in San Francisco, CA. Manny Mejia-Chico State 3:54 1500m PR. Two time All West Region XC runner for the ‘Cats. 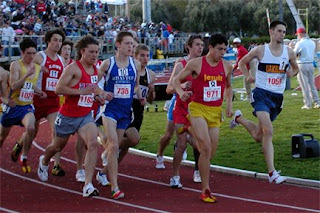 Joshua Linen-Chico State A freshman for the ‘Cats, Josh will attempt his first serious 1500m of the year on Friday. Josh’s HS PR’s of 4:17-1600 and 9:06 for 3200m show plenty of potential at the distance. Pat Boivin-Pacer: Adidas Transports 3:50 1500m PR To help ensure a fast and even pace through at least 800m Pat Boivin a 4 time All American while running at Chico State (and current CSUC assistant coach) will control the initial tempo of the competition. Saturday April 11th, 2009 Sat. Schedule is subject to change, but should be close to final one. Heat II of men’s 1500m will be run just before the Invitational race. Shot Putters get little recognition but Matt Jarvis has gotten some much deserved attention this year. The Senior transfer from Shasta College has twice been the CCAA athlete of the week this season, and is currently ranked 3rd in the NCAA (DII). Jarvis is on the cusp of making history this season. His PR is now beyond the 57 foot mark and our school’s record is only 58’8. Last week Jarvis barely fouled his final throw of the competition. The toss was a bomb that everyone present knew was really far. They (the crowd) pleaded with the official to measure the toss. With some hesitation he did, and announced SIXTY feet, Two inches! Men’s Shot put starts at 6:45pm. Might want to check that out before the 1500’s get started! CCAA Championships In CHICO!!! : Right around the corner are the CCAA Track and Field Championships which are being held in CHICO this year. They will be contested on the first weekend of May (May 1st and 2nd). The first evening will include heats in the 1500 and below as well as finals in the 10k’s with finals going in everything else on Saturday the 2nd. As always, Thanks for your support and we’ll hope to see you trackside on Friday and Saturday! Just a few pictures for your viewing pleasure found online that feature local runners. If you know or have other pictures that we can share, please add the link in the comment box below or send them to me to add to the blog. Any pictures you want me to add, please send them to albertjcaruana@gmail.com. Arcadia Invitational weekend is upon us and it should be interesting what breakout times are dropped at this meet. Any predictions on some surprises from Arcadia? What NCS athletes or teams are ready to make a statement at the state meet level? Thank you to Keith for compiling the following stats. Check out where you rank in Northern CA or in the SJS if that is your section. Today we catch up with Redwood junior Ryan Healy who just finished 2nd. at the recent Stanford Invitational with a lifetime best of 48.87. Ryan is no stronger to success on the track as he qualified to the NCS Meet of Champions finals in the 400m. as freshman and record a 6th place finish. Last year, Ryan qualified for the state meet in the 400m. as he finished 3rd with a time of 49.53. With his sub 49 clocking at Stanford, Ryan has served notice that he will be one of the favorites for the NCS title this year. 1) Besides track and field, in what other sports have you participated? Besides track and field, I play basketball, soccer, and run cross country. 2) How did you get your start or interest in track and field? I started track in 7th grade, but only participated in high jump. I started running freshman year during ski week because I could work out with the runners. The coach wanted me to run instead of jump, but I compromised and did both. 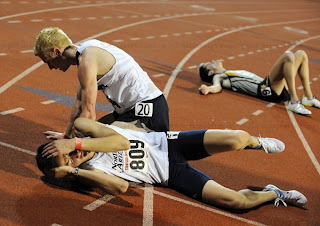 3) When did you first realize track could be a really good sport for you? I don't consider myself as really good, maybe a good high school runner but in the bigger picture I'm just another guy running a race. 4) What track events have you done? I have done the 400, 100, 200, 4x4, 4x1 and high jump. 5) You made the state meet last year as a sophomore in the 400m. Was that a surprise or expected? You know, I had a feeling I would go. I wrote down my goals and going to state meet was the end goal. I knew I was not as elite as the top eight but I would be up there some time. 6) Tell us a little about your first state meet experience and how you feel it will help you this year. Last year in la was just the first of a three time experience. It's good to get the nerves out of the way and go into it next year as just another meet. 7) What runners have you considered as role models or somebody you looked up to on your own team or other teams? I don't really have a role model. I just try to be an individual and work as hard as I can when it's time to work. 8) Favorite competitor? Favorite meet? Favorite event? I do not follow track at the professional level but I watched the Olympics and I just thought it was unbelievable to compete in front of the whole world. For me, I love to run and watch the 200 and I like the way its a fast race and longer than the 100. 9) Tell us a little about your coach and how he has helped you improve as a runner. My coach knows what he is doing and I trust what he tells me to do. 10) What is your advice to young runners who want to do well in track? Picture above shows some fallen warriors including Diego Estrada following his spectacular 13:47.37 at the Stanford Invitational. Below is an interview with him that took place 2 months ago. Today we chat with former Alisal runner and current Northern Arizona runner, Diego Estrada. He was a Central Coast Section (CCS) Cross Country champ in Div. 1 twice. He was a three time state qualifier in the 3200, highlighted by his victory last season in 9:06.51. He also won the Stanford Invite 3000 last year and had CCS best time of 9:04.80, good enough for 4th place at state last year in the 3200. 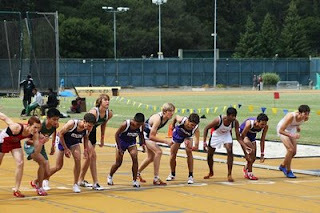 For track being the runner up @ CCS finals as a sophomore, that was when I realized I could do something with my running. I was constantly injured, but never gave up. That made me who I am today. 3) How did you end up choosing Northern Arizona? Coming out of high school, I wasn't were I wanted to be with my running. I had been injured for 2 straight years, the love was gone. I actually quit running. But my high school coach insisted on me visiting NAU where I found trust in Coach Hines, and he believed in me like I used to believe in myself. The altitude was a plus too! The dorm life. Managing time and money. I have a solid team and they help me train since I'm never alone on a run. It's not about me here, it's all about the team. My coach. Me and Coach Flores had a really good friendship. He kept me focused. Coach Flores was always willing to try new things. He understood that every runner is different. It took us 3 years tweaking the workouts till we figured it out. Now I know what my body needs. His main focus was the bigger things. High school was a stepping stone. He was a really good friend and wasn't about the attention. Mainly the 5k, but I'm more of a 10k guy. I'm getting healthy, I'm confident again. Me and both Coach Hines and Flores believe i can go sub 14 in the 5k. 10) Tell us a little about your NCAA race this past cross country season. Going in we had high hopes, as a team and individuals. I was shooting for all American honors. (after having a horrible day at pre-nats I had run 23:33 8k, 30:09 10k @ altitude already.) But unfortunately it wasn't my time. 4 days prior to the NCAA's I slipped on my bike, flew off, and injured myself. That gave me some Achilles problems that lasted for 2 months. It wasn't what I wanted, or what we wanted as a team, but i only learned from my mistakes. There are no free rides here. If you believe in yourself, the sky is the limit. I just like to thank you for the interview. GA JACKS!!!! Keep the suggestions coming for athletes you would like to see interviewed. Looks like a very competitive meet with the biggest turnout in recent years. Many top teams from CCS and NCS will be attending. What looks to be the most competitive races?